Followers of Eva Chen will know that she is posting outfit selfies taken in the stairwell of Facebook's New York office as frequently as her signature #EvaChenPose snapped in the back of a taxi. 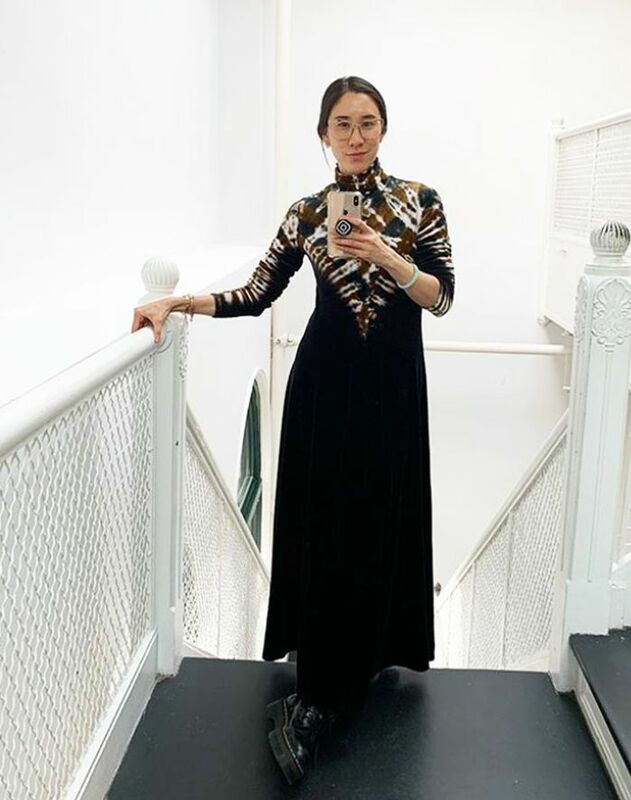 One of her resolutions for 2019 was to wear things other than mom jeans, and four outfits in, we're already loving her approach to workwear this year. She is sticking to classic office-appropriate items, rotating cashmere jumpers, trousers and shirts that are all in a neutral colour palette. Eva stops these looks from feeling too corporate, however, by adding slight twists: When you look closely, you'll notice her smart black trousers are actually made with croc-effect leather. Eva initially gained her huge following on Instagram for posting pictures of her shoes and handbags every day, and so it'll be no surprise that the accessories are the focus of these workwear looks. Eva invests in classics—below she is wearing timeless pieces by Hermès, Chanel and Céline. Keep scrolling to see her four workwear looks we want to copy this year. Style Notes: Eva makes her velvet ankle-skimming dress more casual by pairing it with a pair of chunky Dr. Marten boots and her hair pulled back, with a pair of glasses. Style Notes: Eva has been sticking to simple classics, and here she wears a grey belted jacket with a matching roll-neck and a pair of cropped wide-leg jeans. She tends to wear Chanel two-tone pumps to work, and here she wears a pair of grey and black slingbacks. Style Notes: Eva captioned this image "I am wearing pants today and they are not mom jeans, 2019 RESOLUTION COMPLETE!!!" She wore a pair of croc-printed leather cropped trousers with a grey roll-neck. Style Notes: Eva shows that you can't go wrong with classic investment pieces. Here she wears a classic white shirt with black high-waisted trousers and her trusty Chanel pumps and Hermès Constance bag. Next up, see the key trends for spring summer 2019.